With a special filter, we target the largest (alpha) emission line for Hydrogen. By eliminating all other light, we can see the activity happening in these specific chemicals and learn more about the sun and its behavior. The narrower the bandpass, the more off-band light is rejected. This refinement in manufacturing accomplishes higher contrast. The sun is bright enough. We do not need to capture more light. To add detail, we need 'more dark' or exclude more light. A bandpass filter's width depicts a range of wavelenths are allowed to pass through it. 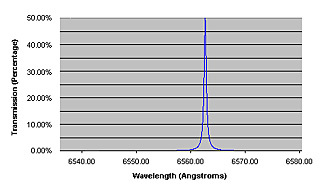 We measure light's color or position in the spectrum by its wavelength. The visual spectrum is found between about 3900 and 7000Å. Red light has longer wavelengths and blue has shorter wavelengths. We measure the distance between peaks in the wave to arrive at its wavelength. That unit of measure is an Ångstrom. An Ångstrom is 1/10th of a nanometer. A nanometer is 1 billionth of a meter. 2 prominent lines for chemicals of interest on the sun are: Hydrogen Alpha: 6562.8Å and Calclium K line 3933Å. Note that the Hydrogen wavelength is almost two times as long as the blue Calcium wavelength. By observing the sun in Hydrogen (with a narrow bandpass filter tuned to 6562.8Å), we can observe the behavior of the Sun's Chromosphere. The chromosphere is like a shell of gas around the Sun's photosphere, it is less than 1% of the diameter of the Sun, and is always moving and changing. The structure of the chromosphere behaves differently in active regions than quiet areas, where magnetic field lines are stronger. The chromosphere is governed by magnetic forces and thought to be tied to the photosphere, yet it still has its own IntraNetwork (IN) of material oscillating independently every 5 minutes. On the limb, even a rather wide filter of 1Å or more will show prominences, a detail of the chromosphere projected against the dark black contrast of space. To observe the details of chromosphere on the face of the sun, we need a narrower filter to eliminate more off-band light of the photosphere and continuum. We need a filter less than 1.0Å. The narrower the filter's bandpass, the more contrast we will see - down to 0.4Å, where prominence structure is reduced due to high velocity and subsequent wing shift. Spicules dominate the chromosphere in non-active regions and have been studied exhaustively. They are barely visible, last only about 15 minutes, and resemble a "burning prarie". Some jets can be seen shooting 10,000 km up from the Sun's limb at velocities of about 30km/sec. Studied exhaustively, they present a number of observing challenges, as they are too small to resolve and move so quickly as to present wing-shift challenges. Field Transition Arches (FTA's) connect P and F spots - elements of opposite polarity . Inside an active region, where sunspots are originally linked by a FTA, a shear bouandary forms. Field Transition Arches are different from filaments in that they are thin and not very dark. The FTA usually has plage or granular structure underneath. Plages: Most of the active region area is occupied by plage. Considerable atmospheric heating takes place in the plage. It is bright in everything from Halpha to the Calcium H and K lines. This heating is thought to account for an absence of spicule. While absent over plage, spicule are prominent around its edges. Filaments appear as large, dark eyebrows across the surface of the Sun. With a brightness of about 10% of the disk due to scattering, they appear dark on the surface, but on the limb, show as a prominence. Active Region Filaments (ARF) differ from Quiescent Region Filaments (QRF). ARF are darker, smaller and have more coherent fibril structure along their axis. A sheared magnetic field runs parallel to this axis, permitting a sizeable flare. QRF may produce a big Coronal Mass Ejection (CME). An ARF may erupt and reform several times. Ellerman Bomb: A remarkable feature of Emerging Flux Regions is the Ellerman bomb. Bright points with very broad Ha wings (±5Å) that are low in the atmosphere so they are not visible on Ha centerline. Called 'moustaches' for their appearance on spectrograph, they appear like wide moustaches with a gap in the middle. This strange and tiny feature typically occurs at the center of the EFR or in the edges of spots - where the field is breaking the surface. Solar Flares are intense, abrupt releases of energy which occur in areas where the magnetic field is changing by flux emergence or sunspot motion. Stresses in lines of force build up slowly and are released in flares. They occur most frequently at neutral lines where a filament is supported by horizontal sheared field lines. This event can only take place along a magnetic inversion line. When many lines of force are involved, two ribbons of emission appear, brightening simultaneously. Emerging Flux Regions: An area on the Sun where a magnetic dipole, or "flux tube" is surfacing on the disk, eventually producing a bipolar sunspot group. Each pole of an EFR is often marked by pores or small developing sunspots. Surges or even small solar flares can sometimes occur in EFRs. An EFR emerges with small bright Ha region with little surges, then weak arch filaments (AFS) over bright plage connect small spots on each dipole. Growth is rapid, forming in just a few hours.